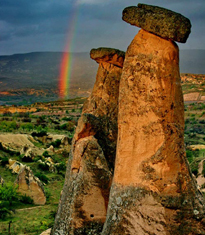 Regular Guided Tours to Cappadocia. The group size maximum will be 15 people on the tours. Rates from 200 EURO per person including bus from Istanbul and back. Depart from your Hotel, for Derinkuyu Underground City to visit the huge refugee settlement carved by early Christians, where they could hide from persecutors . From Derinkuyu continue to the beautiful valley of Ihlara , Formerly known as peristerema. Explore the famous rock –cut churches and hike 4 km through the valley. On the way back visit the monasteries in Selime Village and 13 century Caravansary built by Selcuk Turk’s on the silk road. 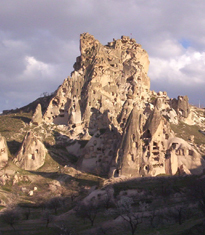 • 2 nights accommodation in special class Hotel or similar in Cappadocia.